ARE YOU LOOKING FOR AN ALTERNATIVE TO CITRIX? PowerTerm WebConnect empowers organizations to benefit from the same key security, reliability, performance, and usability features that Citrix provides - at a price organizations can afford. Ericom's PowerTerm WebConnect, provides secure local and remote access to Windows Terminal Servers, Virtual Desktops, Blade PCs and legacy hosts. This wide range of support empowers organizations to reduce the cost and complexity of traditional desktop management by standardizing on a single solution for the centralized management and delivery of server-based applications and virtual desktops. At the same time, PowerTerm WebConnect optimizes productivity by delivering a uniform and seamless application and desktop access experience to users, wherever they are - at home, their office or on the road. 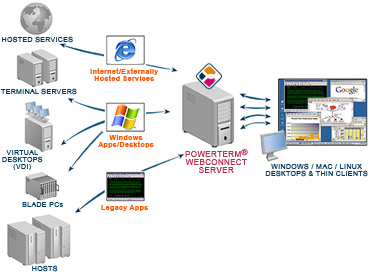 PowerTerm WebConnect connects to applications across the Enterprise - from Windows and Linux desktops, and thin clients. To learn more about the wide range of powerful performance and monitoring capabilities built into PowerTerm WebConnect. Please visit the Ericom website by Clicking Here. To download a .pdf brochure click here.